The Super Skillcase is loading up with players looking to improve their game and name. One player that will be headed to Atlantic City is Terrence “Big Smoove” Williams of Clinton, MD. Williams has been on a tear since we rated him #31 on our Class of 2019 Top 70 list. While some players rest on their laurels Terrence used the ranking spot as motivation. 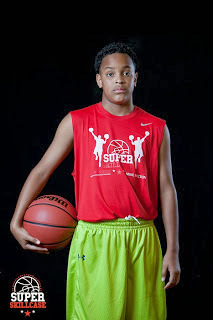 His inspired play earned him MVP honors at the NYBL Top 40 All Star Game. Now he will try to keep that momentum while battling the best at the Super Skillcase. His coach from ETU Select Drew Brelsford has seen Terrence develop this season. “This past season I think Terrence started to understand how to dominate the paint on both ends of the floor. He finishes strong in the paint either from the low block or attacking the rim from the high post. On the defensive end he’s a good rebounder while also possessing the ability to block or alter shots” he finished. After a great showing in Ohio, a good weekend in AC would only give Williams a chance to improve his stock when our spring rankings are released. Stay tuned as we bring you more top prospects headed to the Super Skillcase.